100AH deep cycle marine AGM battery in special box includes plug ins for charging phones, GPS etc. This beautiful launch is traditionally handcrafted in a palette of woods from the County of Suffolk, with Oak, Thawer, Larch to name some. The craftsmanship is apparent in every aspect of her construction. The grain of the Oak used in the gunwhales has been specially selected so that the grain follows her shape, nothing in her construction is co incidental, the knees crafted in oak with copper fastenings, an oak apron, her hull crafted from Larch, that has been cured. The current owner purchased the boat in 2017 and has used her on the River Nene and Fosdyke Navigation for around 20 days. The trailer has interchangeable long and short towing arms, trailer board with lights, spare wheel, wheel clamp and trailer lock. She is kept in the owners garage to protect her from the elements. 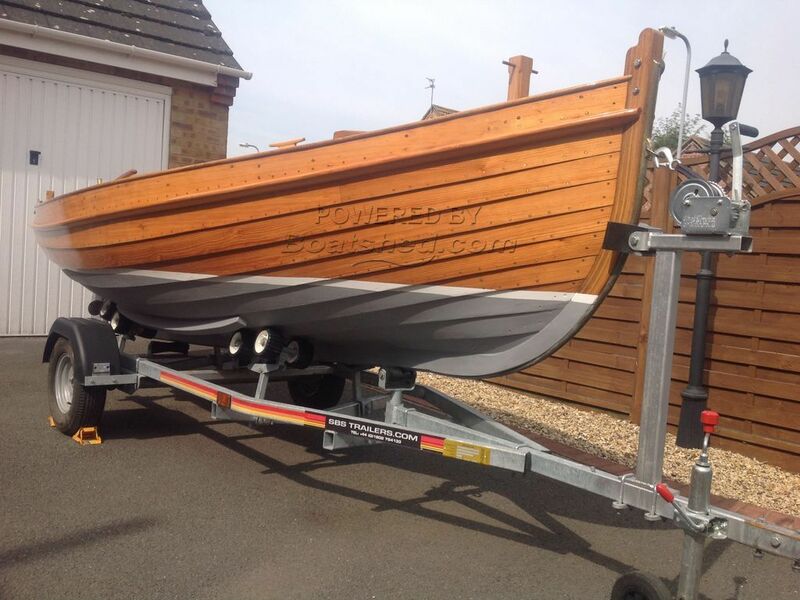 This Dock Harris 14 has been personally photographed and viewed by a representative of Boatshed Lincolnshire. Click here for contact details.